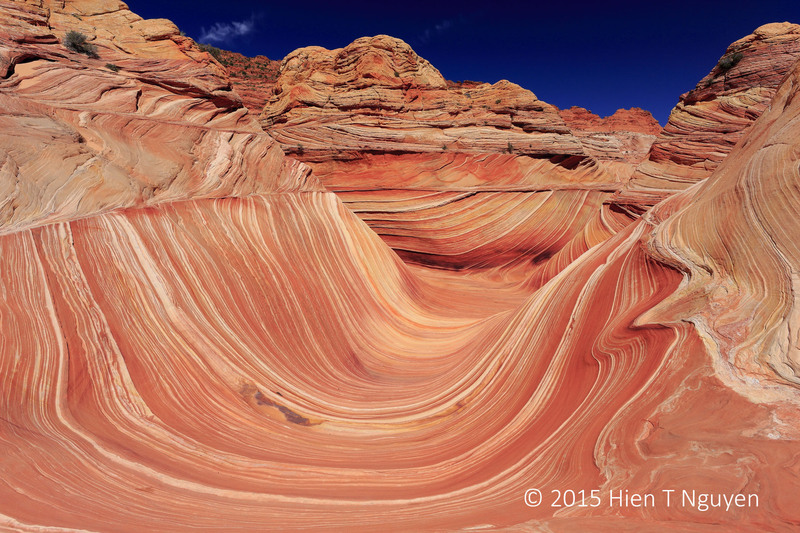 Almost two years ago, I found my photographic reward at The Wave in Arizona, near the border with Utah. I had hiked about 3.5 miles in the already hot temperatures of early June, when I finally arrived at The Wave. The sandstone formation, twisted and eroded by the forces of nature, formed a beautiful and unique landscape unseen anywhere else on earth. I blogged about the Wave earlier here, but the above photo is only published now. Thank you! You have an amazing blog too! Beautiful , otherworldly place and a great image! What a spectacular and unique place Hien! Thanks for introducing us to “The Wave”! Spectacular! I wish I could go there. I remember that post. The wave is most spectacular including this image. Mind like a steel trap, Sue! No wonder your blog is so good! Spectacular view! Great shot, Hien! This is incredible! We are heading to this area in April and now I am completely inspired to visit The Wave….didn’t even know about it until your post. I hope we can get a permit. Thanks for sharing! If you can’t get a permit, try the other places nearby, such as the South Coyotes Buttes. I understand they are spectacular also, and the permits are easier to get. So beautiful. I’d love to hike that place and do it safely. Katelon, I hope you will go there some day. Thanks. My Navajo daughter lives in St. George and when I visit her I’m going to see about setting up a photography hike with a blogger that offers that kind of thing. I might not make it to the wave but at least I could go to lower Antelope canyon. Beautiful photo which really captures the scene. Looks like you had a picture perfect day! Thanks, Eric! In that area, if I am not mistaken, most days are picture perfect. I wish I could be there more often, or even just live somewhere nearby. This is a beautiful photo! Thank you for sharing. Fabulous photo Neihtn, and a wonderful reward after the difficult journey. Thank you, Tina. It was hard and costly, but well worth it. Its so beautiful, no words to describe! Thanks for sharing!! My pleasure. I am glad you like the photo. This is fantastic and spectacular. Words can’t describe it enough- I need to visit this place at some point in the future! Thanks Sukanya! I hope you too will go there in the not too distant future. this place is finally getting to the top of my must do list – 2015, here i come! great shot. Excellent idea! I hope you will post your pictures after you go. absolutely! have booked for april, excited!